2015 Leaf Trinity Football sticks with the formula that it has used since the brand's inception. 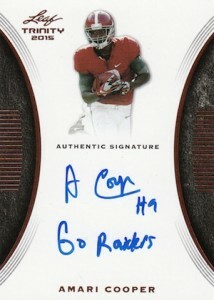 The cards focus largely on three categories: patch autographs, Pure autographs and inscribed autographs. Boxes of the high-end product come with five signed cards. The biggest shift this year is that Trinity Autographs replace inscription cards. These are all signed on-card. And while some come inscribed with added notes, not all of them do. Trinity Patch Autographs also come with on-card signatures. They're joined by large patch swatches from player-worn jerseys. Pure Autographs come with the same clear plexiglass-like stock as years past, however the design has been switched up. They go from a horizontal design with multiple player images to something vertical and with just one photo. All three types of cards in 2015 Leaf Trinity Football come with multiple levels of color-based parallels numbered as low as 1/1. 2015 Leaf Trinity BRYCE PETTY PATCH AUTO RC 25!! PHIL BICKFORD 2015 LEAF TRINITY PURE GLASS AUTO GIANTS! Redemption cards are noted below (R). Good product for middle of the road collectors. And Patches? It clearly states “patch swatches from player worn jerseys”. The best college product all 3 years it has exsisted. I can’t wait! Best product out as far as bang for your buck. Patches clearly state player worn……and I would rather have a patch like these than a plain white one. All autos are on card as well. I pulled one of the sweetest Mariota patch autos I have seen. That first guy posting can go ahead and wait for Prestige so he can get his 12 round white jersey swatch. Very nice product for the price… and love the fact that all the autos are on-card. One negative is that all the cards seem to have a (factory) surface issue on the upper middle section on the right side of the card. I’m just getting back into collecting after a few decades off, so the game has changed quite a bit to say the least. I did my research and decided to pick up a few boxes to feed my hunger. Of the products I got, this was the 2nd most expensive box, the top being a Panini Contenders Draft Picks. This review is slightly biased because I got a great box of cards, but I love the idea behind it, too. Instead of riffling through an ocean of common cards and generic inserts that are less valuable than the protective casing we put them in, you get 5 quality cards and are just hoping for big names instead. You basically just cut out all the set building and cards no one wants and get right to the good stuff. I was fortunate enough to get a /5 a /10 a /25 of the 2nd tier big name rookies (Dupree,Sims,Hardy in order). The 2 unnumbered cards i got were both QBs, which is always a great position to get, one being a Bo Wallace patch card, and a Brandon Bridge that I probably won’t be able to give away. Needless to say, I think I’ll be able to at least make my money back, hopefully double it, and double down on a couple more boxes. Would totally recommend if you don’t mind not opening 25 packs looking for the good stuff. Compared to the price and cards I got in the other boxes I got, this one worked out the best for me. Personally, I love the Pure Glass autos and view them as a relatively inexpensive way to acquire some quality product. I normally avoid college or no logo cards but these are so darn nice! I can’t resist! 2015 Leaf Trinity Football Hobby Box - Factory Sealed!